Waterfront 4 Bdrm, Gallop-kanava / tuhannet saaret; melonta; UUSI KELTAINEN TUB. Get away ja nauti rauhallisesta maaseudusta. Sijaitsee historiallisella reitillä, 15 minuutin päässä Brockville pitkin St. Lawrence River. Rakennettu vuonna 1999 tämä talo tarjoaa modernit mukavuudet vanhanaikainen charmi. Waterfront omaisuuden kauniita maisemia ja villieläimiä. Täysin kalustettu puulattiat ja telakka uinti ja melonta. Alueella on erilaisia ​​aktiviteetteja kaikenikäisille: historiallisia nähtävyyksiä, museoita, antiikkikauppoja, paikallisia kesä- ja talviuristeja, vesiurheilua (tunnettuja makean veden scuba-ajoa sekä rannalle että sukelluksille) ja golfia. Meillä on kajakkeja, kanootteja ja lentopalloa paikan päällä. Tämä koti sopii hyvin perheen lomille, ystävien ryhmille ja pari viikonloppua. Kysy jos etsit jotain erityistä alueella, jotta voimme antaa sinulle lisätietoja siitä, mikä on käytettävissä. The house was well set up. Kitchen had everything we needed. Lots of space for 7 adults. Views!!! We enjoyed our stay, the views were excellent from every room. We watched an otter on the ice edge have his breakfast. We went skating at a local arena. The kitchen had everything we needed to satisfy our family of foodies and cooks!! A great place to spend quiet family time. A visit to Merrickville was a morning outing, we also planned a car rally with some local trivia so the family got to know the Seaway history. A very comfortable stay. Beautiful property. Fabulous sun rises. This property has everything you could want for a summer vacation stay. 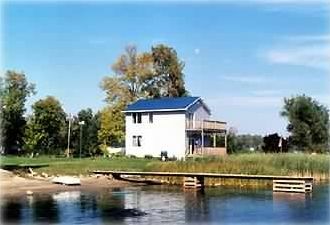 It is right on the St. Lawrence River and has plenty of things to do. All of the furnishings are modern and pretty with all amenities available. The sun rise from the master bedroom windows is breathtaking. Our only concern was the stairs. While they are beautiful, they are very slippery. Absolutely do not wear socks when on them. Christine was very responsive to my many questions and was a delight to work with. I would highly recommend this property. Simple and nice place just need food and clothes. We rent as well and know that it is nice to just show up and not need to worry about having enough dishes or pots to feed the group. Glad you enjoyed your visit. Christine was very helpful and friendly. The home was beautiful and clean and the river was just breathtaking. Hope to visit again. Thank you for your review. We built there because of the fantastic unobstructed views of the river and the beautiful sunrises and lots of birds and wild life. Please do come back. We really enjoyed our stay. The house was clean and had all the essentials. Christine was so helpful and accommodating. We had a great time fishing off the dock and kayaking. My kids loved playing in the sand and getting their feet wet in the lake. We also enjoyed visiting Upper Canada Village, it was a great and fun way to show the kids how people lived in the 1860's. It was a memorable family vacation! I apologize for the delay in response. It has been a really busy season. We are so happy that it met the needs of your family. Lots of do in this area. This was our second time staying at this cottage and both times we were very happy. Brand new dock and bbq which were the only real issues last year. Hosts are friendly and helpful and will address any questions or concerns you might have. Beds are clean and comfortable. And you can't beat that view! Would like to make this an annual event. Paljon paikallista toimintaa kesäkuukausina; Upper Canada Village, Fort Wellingston, teatteri St. Lawrence Shakespear festivaali, Upper Canada leikkimökki. When having additional guests over 8, there is an additional cost which can be negotiated depending on the size of the group.